I hope everyone is enjoying the Holiday Season, no matter which holiday you celebrate. If you don’t celebrate anything and are just enjoying some time off I suggest you look back on the previous year and celebrate Rugby. It has been quite a year for the good old U.S. of A. Both our men and women have performed exceedingly well this past year as the fruits of our High Performance programs is starting to pay off. The women finished the year ranked 5th In the world in 15s and finished 4th in the 7s World Cup and could make a case for being #2 behind the mighty Kiwis. Remember, they lost a close, back and forth semifinal to New Zealand 26-21 and were the ONLY team to score points on the Black ferns. Let me rephrase that: The scoreline against the US was 26-21. The scoreline against everyone else was 105-0 and that includes the World Cup Final. The men finished the year ranked 12th in the world – their highest ranking ever – and recorded their first ever win against a Tier 1 nation when they took it to Scotland. With 2 straight ARC titles and a win over Samoa they look ready for the World Cup next year. The 7s team lost a semifinal in over time to runners up England in the World Cup and have established themselves as a perennial Cup contender and one of the most feared teams on the circuit. Perry Baker also had a very impressive year as he was named the World Rugby 7s Player Of The Year for the second consecutive year. As I sit here this Christmas Eve to write the final Hail Pelicus of the year I am tickled pink to be able to say that the USA is ranked #1 in the world in 7s. Gods, but that felt good to type. So good that I am going to do it again. The USA is ranked #1 in the world in 7s. This was an off year for Northern California when it comes to championships. The men were completely shut out but the ladies stepped up. Chico St Women won the collegiate D1 national championship and Life West women won the second consecutive D1 club championship by oh, about 70 points. They followed that up this fall when the WPL, after several years of stalling and hemming and hawing, finally relented and allowed Life West a play in game to join the league. With only a few days notice the Gladiatrix took flight for Atlanta and beat the DC Furies by, oh about 90 points. So now I throw the gauntlet down. To all NCRFU clubs who care about 7s, I challenge you. Take back what is rightly ours. Life West, SFGG, San Jose, O Club, Sacramento, Santa Rosa, Amazons, All Blues, you may think you train hard but it isn’t hard enough. Everyone else, this is your chance to do something special. Push yourself. Dedicate yourself. Southern California will be sending 3 teams to nationals while we have none – this is intolerable. Focus. Start training earlier. Play more tournaments. Commit. Travel outside our region to get better competition. In the past we didn’t need to do that because the best was right here. Not so any more. The purest form of rugby must come home or there will be a wailing and a gnashing of teeth and other indecent carrying-on. The Hail Pelicus isn’t a one man operation and the publication relies on all the match reports that the Pelican Society produces throughout the year. Of special note are the Pelicans who have moved on to other pastures yet still send in reports – we love them so keep them coming. Every time a Pelican goes on exchange we get a report. Every time a Pelican travels just for fun and gets some rugby in we get a report. This is the heart and soul of this publication. I would be remiss if I failed to mention the contributions of Our Noble Leader Paul Bretz, aka Pelicus Iudex Pennipes, as I often take his general announcements to the Society and copy paste them directly in and, of course, Dr Bruce Carter, aka Pelicus Scriptoris, for his guest columns which are welcome at any time. We here at Hail Pelicus often throw in some Latin phrases and other references to classical Greco-Roman culture as well as references to books, movies, musical theater and, of course, obscure words. We couldn’t do that without our research department headed up by Ibid, but you know him already. Hail Pelicus: Quite. I understand you have signed up for another season of your hit show Penn & Teller: Fool Us where magicians come on the show and perform tricks while you and Penn try to figure out how it is done. Do you prefer being fooled or do you prefer it when you are able to spot the trick the magician is using? Hail Pelicus: You don’t say? Hail Pelicus: Fascinating. Moving on, did you ever watch or play rugby when you were younger? Perhaps in college? Hail Pelicus: I did not know that. Hail Pelicus: So what is your opinion on the state of US Rugby? Hail Pelicus: Some strong language there, but I can not disagree with you. I appreciate the passion as well. Hail Pelicus: (laughing) Ha! I’m dying here! Now that is a story that you may wish doesn’t see print! Hail Pelicus: (more laughter) I didn’t even know that was possible! I’m in tears! Moving on, with the Rugby World Cup coming up, are you willing to make a few predictions? Hail Pelicus: Bold. With you living in Vegas you may be tempted to put your money where your mouth is. Hail Pelicus: Totally agree. One final question, if you would be so kind. Yanny or Laurel? Hail Pelicus: My feelings exactly. That is all the time we have so I would like to thank Teller for his time and if anyone wants to purchase that perfect gift for the rugger in their family audio recordings of this interview are available. This was another late appointment that I was able to pick up in the London area. In this case, the Hendon seconds’ scheduled opponents (Barnet Elizabethans II) begged off at the last minute. Hendon was able to arrange a friendly match against one of their other regular opponents in this league, which meant I got to ref this past Saturday on a slightly cold, windy, but otherwise great day for rugby. Hendon’s clubhouse is in North London, just off a major road, and somewhat hidden behind an auto repair/tire shop. Nonetheless, it was an easy tube/train/uber ride away from central London, and the normal practice here is for the home club to pay the refs’ travel expenses after the match. They still had many of their Halloween decorations up. The Saracens play at Allianz Park, which is a very short distance away – the grandstand is easily visible from Hendon’s pitch. This particular Saturday, Hendon’s first side was playing on the adjacent pitch to their second side, which was my game. Each side had 18 players on its roster, though as a friendly, there were no limits on substitutions. There was also a lack of front row replacements, and most of the match was limited to uncontested scrums after one of the props went off injured fairly early on. There was a paucity of scoring in the first half, with Cuffley getting the only points on the board with a 7th-minute unconverted try. The remainder of the half saw some good line breaks, lots of tackling, and a lot of knock-ons with no opportunity to play much advantage. Luckily the uncontested scrums didn’t tire out the forwards. There was one moment of unfriendliness near the end of the first half, in which a few swings were taken, but none of these connected and good order was shortly restored after a few words from me and a handshake between the would-be pugilists. The half ended with Hendon attacking the Cuffley goal line repeatedly, only to knock the ball on a few meters out: 5-0 to the visitors. 29-14 win for Cuffley, given the amount of time left in the match. After changing, one pint, and catching up for a bit with the captains, we all caught the last 10 minutes of the England-South Africa game which was being broadcast in the clubhouse bar. The place emptied out soon after that and I took my leave, heading back to central London the way I came. Thanks to both teams for playing at short notice, to the touch judges (including the very young deputy TJ), and for the hospitality after the match. This match was located in Dagenham, an eastern suburb of London that generated a pretty consistent raised-eyebrow reaction whenever I mentioned to anyone where it was. It seems that people don’t find it too nice of an area, but that kind of thing doesn’t bother me: I was there for the rugby. One explanation of that simple reason for my presence got perhaps the best reaction ever. “What’s an American doing here?” “Well, I’m just here for the rugby.” “In Dagenham?” (with the last question being one of total disbelief and incredulity. 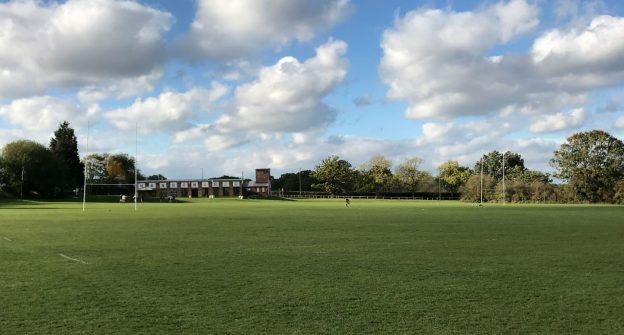 The neighborhood may be considered the London area’s equivalent of Richmond’s iron triangle, but the group of students I refereed was some of the best-behaved and well-coached high school teams I’ve had the pleasure of refereeing. Robert Clack’s mission seems to be to use rugby as a channel for adolescent energy, producing positive outcomes in the lives of its young men and women. I doubt there are too many other schools in similar neighborhoods sending their students to Cambridge. It reminded me of the Oakland Warthogs program (see https://www.telegraph.co.uk/sport/columnists/jimwhite/2308586/How-rugby-turned-bad-boys-into-ambassadors.html for a relevant 2007 article). Both teams had plenty of large, fast players, including a few wearing kit from some of the top men’s clubs in England, and one whose 400m dash time ought to have him in the British Olympic track squad. We kicked off at 1500, after a somewhat drawn-out wait for the visiting team to arrive while I was starting to be eaten alive by mosquitoes. After a short bit of back-and-forth play, Robert Clack scored the first (converted) try 9 minutes in. Harris stayed strong and held the hosts scoreless until 21′, 25′, and 30′, when their defense cracked and they allowed 3 more tries, all unconverted. This was a classic case of the slightly smaller team (Robert Clack) playing better rugby as a group, vs. the larger/faster Harris players making more individual attacks. This led to me having a word to the Harris captain after the 3rd time a particularly large player had smashed through the defense, then getting pinged for not releasing the ball after being tackled, primarily because he had isolated himself. Thankfully that trend stopped, and there was only one further home team score 36′ in, with a converted try for a 29-0 halftime lead. 20 minutes left to play. There were no lights, and more mosquitoes. At the 30th minute, Robert Clack picked up another try, converting this one, for a 36-5 lead. That secured the win, but Harris had the last word with a try 2 minutes past the end of the half that I had to work hard to see clearly, given the twilight conditions and, just before that last score, a tackler’s flying boot to the softest part of the top of my ankle that left me hopping on the other foot. Ouch. Harris were happy to win the second half 10-7, Robert Clack was happy to pick up what I believe was just their third win of their season, and I was really happy with the way each team played and responded to my management suggestions. Both of these groups of young men were a pleasure to ref, aside from that annoying ankle stamp I couldn’t avoid, and I’d be happy to go back to Dagenham anytime I’m sent there. Good luck to each team for the rest of the season, and thanks to the TJs and the Robert Clack coaching staff who got me set up in their well-equipped referees’ locker room. Chico 10 USF 17 (2 tries to 3 plus one conversion). This was Chico’s first game and USF’s second at this event; USF had a fairly large group of players and rotated them. Chico are well drilled but the players needed some game exposure. Stanford white 17 vs Chico 17. Stanford scored twice in the first 10 minutes and then again after the half before Chico got their first and second score – both under the posts but they couldn’t manage to make contact on the attempted drop kicks. Then Chico scored a third time as time expired and finally sent out a tee for a harder kick. Of course this kicker was able to make the kick for the 17 all tie. Day 1 was a lot of fun. Some very good rugby, and a lot of corny jokes by the announcer. Day 2. Send help, my legs feel as like the Tin Man’s before they oil him up. Another great day, but that’s a lot of running. Wouldn’t trade it, but it was a lot. This was the first of two matches on my first weekend 15’s trip since I’ve been at UCSB. I took the train up after Friday class and stayed with a buddy for the evening and drove out to the field the next day. The match was played at Atascadero High’s football field due to a mix up with Cal Poly’s regular fields. This ended up shrinking field size which I believe worked to Chico State’s advantage in both games. The first match was essentially a way to let new players get match time. Cal Poly had quite a few new players as did Chico (apparently they’ve converted a couple of baseball players into wings). Because of the large amount of new players, there were constant subs just to get kids minutes. In my opinion, this created a bit of chaos and there wasn’t much continuity to the match because of gaps in skill and chemistry. However, it was still a high paced and intense match. Chico State scored first early into the first half after a few bruising runs by their forwards (who were much larger than the Cal Poly forwards) and then a quick knifing run through the middle by the Chico backline. I arrived at the GAA field on Treasure Island to see a locked field and a group of SF Fog players passing a couple of balls around. Chatting with Dany (the chubby unicorn) Samreth, waiting for the Bald Eagles and the lock code. Getting into the field about 45 minutes before game time, and Bald Eagles began to drift in while the Fog warmed up enthusiastically. Both teams agreed to no kicking in front of the 22m line, full halves with a break at 20 minutes for changes (and recharging time for the older guys). The Fog started strongly and clearly had pace and energy on their side against a group of old guys with significant rugby intelligence but not able to do things as fast as they remembered. Half time was 4 tries to 1 in favour of the Fog (no goal posts so no kicks at goal). The Fog then introduced more rookies and loaned one of their better players (a wing with good pace). The rookies couldn’t compete with the rugby savvy of the Bald Eagles or, more specifically, the pace of the winger loaned to the Bald Eagles. The second half was 4 tries to 3 in favour of the Bald Eagles but at least 6 of the scores were actually by Fog players. 6pm at Spartan Stadium is an excellent venue – great surface and excellent lights! After a short discussion on ensuring everyone one was on the same page for the line markings on the American Football field the pre-match formalities of boot checks, captain introductions and coin toss were executed. Santa Clara kicked off and the opening 5 minutes was dominated by San Jose although both sides took a few minutes to settle into the game. On 10 minutes Santa Clara showed that they had settle down and following multiple phases crossed near the posts for a converted try (0-7 on10 mins). The next 10 minutes was played mainly between the 22’s with multiple turnovers from both teams. At this point, San Jose took a decided upper hand for the remainder of the half – in particular with some strong running from their outside center. On 25 mins, she crossed for an unconverted try on the left and then catching a slightly long restart kick accelerated through 2 attempted tackles, swerved around the fullback and sprinted from the half way line to score under the posts. The conversion pushed the score to 12-7 on 27 mins. San Jose remained on top for the remainder of the half and extended their lead when being awarded a penalty on the 22m line to the right of the posts. Their kicker indicated a shot at goal to me and rather than wait for a kicking tee just turned and split the uprights with a text book drop goal. Half time 17-7. Santa Clara opened the second half well and on 46 mins broke through for an uncoverted try for 17-12. San Jose’s No 13 responded again and on 52 mins crossed for her hat-trick – converted for a 24-12 lead. For the next 15 minutes, play moved from end to end in a very open game – control was not always accurate but the enthusiasm and commitment of both sets of players brought the supporters to life with plenty of loud encouragement. This raised the players efforts further – the subs bench was used heavily by both sides as players tired through the committed efforts. On 27 mins, San Jose crossed again for an unconverted try to stretch the lead to 27-12 and the game looked to be settled. Backed by some very vocal support, Santa Clara finished with a flourish scoring 2 tries (1 converted) to close score to 27-24 with the last play of the game. After a well fought and good humored fair contest throughout the two sets of players clapped each other off the field with the vocal supports joining them from the stands. UC Santa Cruz started very strong, with multiple pick and drives from rucks. UCD didn’t have much of a response to this strategy until their back picked off a pass and scored under the posts. Santa Cruz were game, and responded with a try. But from then on it was all UCD, with brilliant phase play, strong up and unders, and good defense. Standouts for Davis included Tarik, the flyhalf, and the entire forward pack, with number 7 showing especially well. Santa Cruz’ number 8 did well with numerous strong runs and the flyhalf exhibited great kicking skills. First 15s start in norcal due to the bad weather a couple weeks ago. The weather was poised to open up and downpour and at the start of the game, our odds didn’t look great. Within the first 10 minutes the sky cleared and the match was a sunny one. It was a close score at halftime with UCD trailing 12-10. With the large turnout that the UCD women saw on their team, they rotated in substitutes. UCSB traveled with about 17 players who toughed out the entire 80 minutes. The UCSB women ran away with it as their offloads and discipline at the breakdown kept them with overlaps and finding the gaps. This was my first run since I tore my meniscus in October. Happy to say no issues or pain. As for the game… Cal Poly women dominated the play early on scoring 19 points before CSU Monterey Bay go on the board. Cal Poly played a more open style game utilizing their 3 dominate players: 6,8 and 10. However, 6 and 8 went out with injuries and that left the door open for Monterey to come back using a more controlled pick and drive attack. While it wasn’t particularly attractive it was effective; as the first half drew to a conclusion Cal Poly was up 31-19. In the second half CSU continued to use their pick-and-drive to establish quick ball then used their wing to create lots of runs. With 21 minutes to go the game was tied @ 31. That was it for Cal Poly as CSU pulled ahead for good scoring 2 more converted tries to make the final score 45 to the visitors and 31 for the hosts. Hendon RFC in Hendon, London, England, United Kingdom. Not too shabby. This entry was posted in News on December 24, 2018 by James Hinkin.